Samaritan's Purse is ready to quickly respond wherever disaster strikes. Earlier this year, our DC-8 aircraft delivered staff and supplies to Hawaii after areas of Kauai were inundated by nearly 50 inches of rain in a 24-hour period. A photographic look at how Samaritan’s Purse is bringing relief and the hope of the Gospel to hurting people across continents. From responding to deadly floods in western Japan to providing spiritual refreshment for military couples at our wilderness lodge in Alaska, the sun never sets on the work of Samaritan’s Purse. We praise God for how He is using Samaritan’s Purse teams across the globe to help people in need. Through your faithful partnership, we have cared for mothers in Asia living in poverty, rebuilt homes for families in Iraq who fled from ISIS, provided cleft lip surgeries for patients in South Sudan, delivered Operation Christmas Child shoebox gifts to an unreached people group in the Philippines, and so much more. As you scroll through the slideshow, you’ll see photos representing highlights from our work in 2018. Our disaster assistance response team in western Japan helped mobilize local churches to assist hurting homeowners in the aftermath of deadly floods. We delivered Operation Christmas Child shoebox gifts to an unreached people group in the Philippines and led The Greatest Journey. In one village, more than 40 children and a number of parents have prayed to receive Jesus Christ as their Savior. These children in Mongolia were thrilled to receive special gifts in their Operation Christmas Child shoeboxes. This was the first time for many of the children to receive a present. We are teaching mothers in remote villages in Cambodia how to cook healthy meals for themselves and their children. Samaritan's Purse opened a Diphtheria Treatment Center in Bangladesh to serve Rohingya refugees in desperate need of medical care. Through Project Nehemiah, Samaritan's Purse is rebuilding hundreds of homes for believers in Iraq who fled from ISIS. Dr. Read Vaughan is a radiologist serving at Tenwek Hospital in Kenya through World Medical Mission. Every year we send out more than 600 volunteer Christian medical personnel to more than 40 mission hospitals around the world. We praise God for the children in Togo who heard the Gospel through Operation Christmas Child outreach events and who will learn more about God during The Greatest Journey. Our medical teams performed cleft lip surgeries for 87 patients at Juba Teaching Hospital in South Sudan. Since 2011, we have operated on more than 500 cleft lip patients in South Sudan. Operation Christmas Child shoebox gifts are a tangible expression of God's love to children in Mexico. Shoebox recipients were also invited to join The Greatest Journey discipleship course. 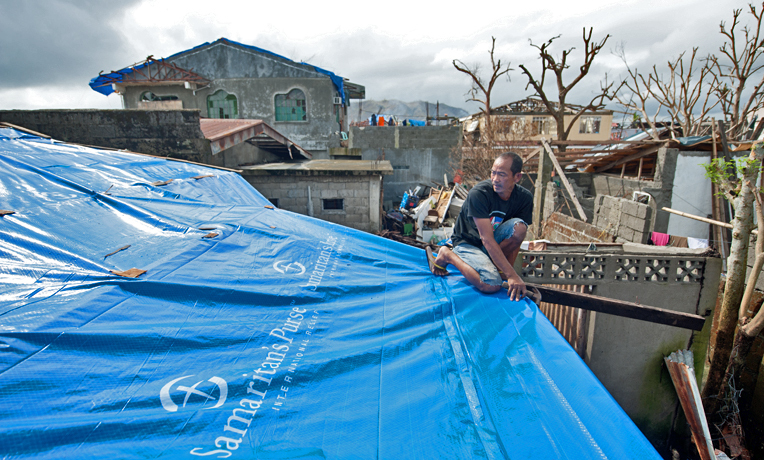 Our teams tarp a roof on Barbuda, which was hard-hit last year by Hurricane Irma. We continue to rebuild homes and churches across Puerto Rico, Dominica, and St. Martin that were devastated by both hurricanes Irma and Maria. Franklin Graham led four Operation Christmas Child outreach events in the Dominican Republic. More than 250,000 children in the Dominican Republic will hear the Gospel this year through outreach events. Heavy rains caused flooding across Hidalgo County, Texas, and left many homeowners with nowhere to turn for help. We responded quickly in Jesus' Name and our volunteers are still working hard to remove ruined furniture and appliances and to tear out waterlogged flooring and walls. Our volunteers are helping families in Texas move back into their homes after Hurricane Harvey slammed into the coast of the Lone Star state. Children's Heart Project continues to arrange heart surgeries for children who live in countries where they lack access to necessary medical care. Sarana, a 10-month-old patient from Mongolia, had surgery in Colorado and is our 1,285th patient since the project started in 1997. Marine Staff Sergeant Tre Tremillo and his wife Tina were baptized during their week in Alaska with Operation Heal Our Patriots. Hundreds of military couples have made commitments to Jesus Christ and rededicated their marriages since the project began in 2012. We airlifted tools, relief supplies, and key personnel to Hawaii to help families struggling after devastating floods. Nearly 400 volunteers served during this response and 19 people prayed to receive Jesus Christ as their Savior. Where Most Needed Your gift to "Where Most Needed" equips Samaritan's Purse with the resources—including personnel, materials, supporting services, buildings, and equipment—to fulfill our mission of relief and evangelism worldwide.